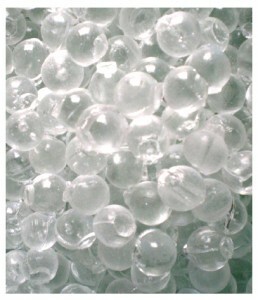 Siliphos consists of glass-like polyphosphate silicate spheres that prevent scale and stop corrosion. There are a variety of strategies used to prevent scale buildup on pipes and fixtures. These are generally lumped together and called “softening” devices, although “softening,” if the meaning is removal of the “hardness” minerals calcium and magnesium, can only be properly applied to the conventional ion exchange water softener or to reverse osmosis units. Here’s a look at the most popular scale-fighting strategies, starting with the conventional “water softener” itself. Although the origin of the conventional water softener is not too clear, it likely goes back to the early 1900s. The softener works by “exchanging” sodium for calcium and magnesium, so that the hardness minerals are actually absent from the water and cannot cause scaling of pipes or spotting on dishes and automobiles or cause soap to fail to lather. Actually, conventional softeners can be used to do a lot more, like removing iron and manganese from well water and, in specialized formats, dealing with tough contaminants like ammonia, lead, strontium, barium, and radium. The effectiveness plus the reliable and predictable performance of the softener have made it popular, but it is not without its problems and its detractors. The ion exchange softener uses a fair amount of water to regenerate its resin, it puts salt into the environment, and its product water can have a “slickness” that many dislike. Although the newer, more sophisticated softeners use less water and less salt than early models, they still use salt and water, and many cities have banned or restricted their use. We should add that softeners are among the most aggressively marketed consumer items and, consequently, they are sometimes sold for too high a price and to consumers who don’t really need them. If you need one, they’re great, but beware of silver-tongued marketers. The use of phosphates to inhibit scale buildup goes back to the early 19th century. Phosphate treatment does not remove hardness minerals but “sequesters” them to prevent hardness scale deposits. Preventing scale with phosphates has wide application. Poly-phosphate cartridges (which often combine phosphate with carbon to add taste/odor improvement to scale prevention) are very popular in restaurants, for example, to protect equipment such as coffee machines from scale while providing good-tasting water. Poly-phosphate can also be fed as a liquid into a water stream to protect home appliances and to prevent hardness buildup on buildings and sidewalks from irrigation water. The popular Siliphos cartridges are an application of phosphate technology. There are highly concentrated chemicals that can be pump fed into the water stream to protect large reverse osmosis membranes from calcium scaling. Spectraguard, for example, is used to protect reverse osmosis membranes from calcium scaling even when inlet water is extremely hard. It can replace a water softener for RO pre-treatment even when hardness levels are very high. By far the most popular new “salt-free” technologies, however, are NAC (“Nuclear Assisted Crystallization”) and TAC (“Template Assisted Crystallization”), which have become very big in the residential market. These work both as tank style units, which require no backwash, no electricity, no salt, no drain connection, and cartridge-style units for smaller applications. Like other alternative methods, they do not actually soften water by removing hardness minerals, but instead purport to convert hardness to microscopic crystals. As with other non-traditional softening methods, NAC and TAC units do not actually remove anything from the water, so their performance is essentially impossible to quantify with a test. These units cost a bit more than conventional softeners, but do not consume water, salt or electricity. The media, however, is expensive and requires replacement, usually after 3 to 5 years. TAC/NAC units are also more fragile than softeners, requiring protection from sediment, chlorine, copper, and iron. We do not sell magnets or electronic conditioners, but we do offer small poly-phosphate cartridges and feed systems (pumps, tanks, media) for larger applications. We have Spectraguard for large RO protection. We have KDF in bulk, in cartridges, and in shower filters. We have all sizes of TAC (OneFlow, also sold as ScaleNet). With ScaleNet we stock media, cartridges, and pre-built units. We ask customers to remember that TAC systems are not water softeners. They are scale preventers, and they do not do all the things that conventional salt-based softeners do.